choose the right lamp for every room and mood. Always standing at attention, floor lamps are the unsung heroes of any lighting scheme, providing much needed illumination to a variety of rooms without time-intensive installation. Offering both widespread ambient lighting and direct task lighting, floor lamps are versatile enough to suit whatever mood you’re going for in a space. But finding the best one can still be daunting. Read on to learn about the things to look for while seeking the perfect floor lamp. The general setup of a floor lamp is simple: a sturdy base that stands steadily on the floor; a tall stem extending from the base; and well, a light that might be direct or diffused. While the bare bones remain the same, floor lamps come in a variety of styles, each with their own unique functional benefits. The most common type of floor lamps, ambient floor lamps are meant to provide general light to a space. They are topped with a traditional lamp shade, which diffuses the light for semi-direct illumination, making them great for a living room corner or next to a comfortable sofa or lounge chair. They typically provide enough light for reading nearby, though not as focused as the light from a reading lamp—but more on that later. A floor lamp meant for reading provides more direct, focused light than other types of floor lamps. If you’re looking for a lamp to brighten up your favorite nook, a desk or a place you do other daily tasks, a reading lamp will usually offer brighter illumination to the space directly below it. For added versatility, look for a reading lamp with a tilting shade, flexible arm or other adjustment capabilities so you can move the light exactly where you need it. Similar in structure to their traditional shaded counterparts, torchiere floor lamps are distinguished by their upward-pointing shades. The unique direction of this style of shade makes the light more of an accent than ambient or task lighting and can add dimension to corners and walls with its pop of uplighting. While standard floor lamps stay pretty stationary where you put them, an arc floor lamp can offer a bit more versatility. Combining a reading lamp and an ambient floor lamp, arc lamps have a stem that extend up and out. When the stem is adjustable, you can move the shade directly over the space to light it more directly, making it ideal for task lighting such as reading on a chair or working at a table. 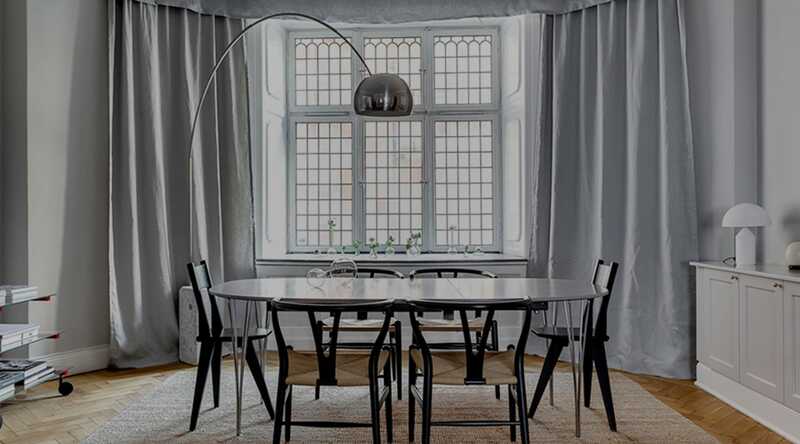 Other arc lamps can duplicate the effect of an overhead light, stretching way up and over a space so they can be used over a living room conversation spaces or even over a dining table. The cost of floor lamps can vary wildly from low-cost, purely functional models, to thousands of dollars for artistic or design pieces. Generally, the more intricate the aesthetic or desirable the name, the more expensive the piece will be. But the nature of a floor lamp often means a fantastic design can serve as a work of art for the room it’s in. Size can vary quite a bit as well. Shaded or torchiere lamps, while tall, take up a narrow amount of space due to their vertical orientation, making them easy to fit into the surrounding space. Meanwhile, arc floor lamps take up more space due to their horizontal extension. It’s crucial to know how much space you have to fit a floor lamp into, so you can be proactive about finding the right size. If you’re looking at a lamp with a tripod base, make sure you have enough real estate on the floor and in the surrounding area so the lamp doesn’t feel cramped or is constantly being run into. Height is another factor to take into account. The higher the light source, the wider spread of the light. This is great for ambient lighting, but may be less ideal for task lighting where you want the light closer and more focused but out of the way so you aren’t bonking your head when you’re sitting next to it. Also consider the scale of everything else in the room—if you have a penchant for low, platform-style furniture, make sure the lamp you choose isn’t going to tower cartoonishly above it all. Some floor lamps come with adjustable heights, which can be handy if you’re prone to switching things up often. Finally, choose a floor lamp that allows the light source to be concealed outside of your eye level to avoid an uncomfortable glare. So if you’re standing nearby, the light source of the lamp should be covered by the shade. Perhaps most importantly, you should pick a floor lamp based on what type of lighting the room needs. Look to the three key layers of light to decide: Ambient, task and accent. Maybe you want warm ambient lighting, which an array of shaded floor lamps can provide. Or, maybe you just want some direct illumination to light up your reading chair with, in which case an arced reading lamp would be ideal. Or perhaps a torchiere just to brighten up a corner and add some accent lighting. The style of light that the floor lamp emits should affect its placement as well, so make sure you get the right piece for the space. Without further ado, the floor is all yours.